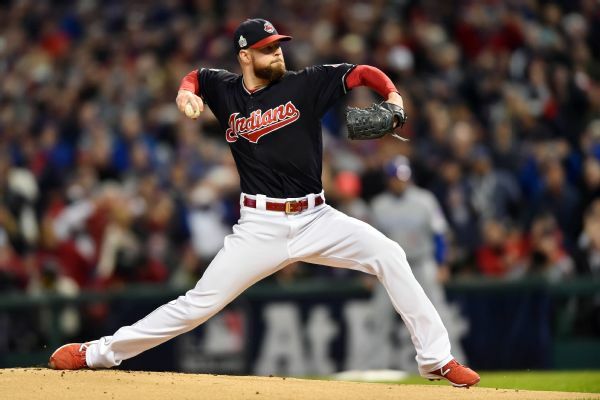 CLEVELAND --Indiansace Corey Kluber became the first pitcher in World Series history to record eight strikeouts in the first three innings of a game. Bob Gibson, Randy Johnson and Orlando Hernandez had each struck out seven among their first nine outs. Kluber's eight strikeouts set an Indians World Series record for a game, breaking the previous best by one. The most strikeouts in a World Series game is 17 by Gibson when he opened the 1968 World Series against the Detroit Tigers. Kluber left the Indians' 6-0, Game 1 win after six shutout innings and nine strikeouts, and with the Indians leading 3-0. He limited theChicago Cubsto four hits and no walks. The Indians have had only two different pitchers in their history to have 10 or more strikeouts in a playoff game. Charles Nagy had 12 in Game 4 of the 1996 American League Division Series vs. Baltimore, while Bartolo Colon had 11 in Game 1 of the 1999 ALDS vs. the Red Sox and 10 in Game 1 of the 2001 ALDS against Seattle. Corey Kluber strikes out nine batters over six scoreless innings to lead the Indians to a victory over the Cubs in Game 1 of the World Series.